How much is 7 + 11? Moving slowly along the banks of the Chobe River, The Zambezi Queen is a 42 metre long, 5-star luxury houseboat offering unparalleled sophistication in one of the most remote locations on the planet. Zambezi Queen navigates up to 25km of the Chobe River, allowing guests to explore different vantage points and enjoy unparalleled game viewing in complete comfort and elegance. There can be few natural wonders as synonymous with Africa’s raw wilderness as the great Chobe River. These waters divide Namibia’s Caprivi Strip from Botswana’s Chobe National Park, and its exotic banks boast one of the densest populations of wildlife on the African continent. Teeming with life, this National Park sprawls across some 11 000 square km of lush African bush and is home to the largest populace of elephants in the world – currently estimated at roughly 120 000. Along with the elephants, leopards and lions, huge groups of buffalo, waterbuck, roan, eland, sable, giraffe, and, if you are lucky, one of the rare puku, can also be seen. In the river itself watch out for hippo and crocodile, and keep your binoculars at the ready for spotting a rich selection of bird life. It is on this great expanse of untamed water an adventure, unlike any other awaits. Why join the crowds on land-based game drives when you can experience the thrill of it all from your own private suite aboard a luxury 45-metre riverboat? The Zambezi Queen operates in 5-star opulence and is all about pampering, indulgence, and superior comfort. Whether you are dining on our third level restaurant watching the animals gather at the water at dusk, game viewing from one of our private boats, or attempting to land your first tiger fish, our professional team will be on hand to meet your every need. Operating on the Chobe River, situated between Namibia and Botswana, the Zambezi Queen is based on the banks of the Caprivi Strip, only a few kilometres from the place where uniquely, four countries meet, namely Zimbabwe, Zambia, Botswana and Namibia. The boat is conveniently located about 80km from both Victoria Falls, Zimbabwe and Livingstone Zambia and 3km from Kasane International airport with regularly scheduled flights to Johannesburg. Guests will be collected from the airport and transported to immigration, situated on the banks of the river at Kasane in Botswana, followed by a 10-minute boat transfer to our docking station. From the Namibian side, transfers are by menas of a 30 minute charter flight from Victoria Falls to Impillia Island followed by a 10 minute boat ride aboard one of our tender boats. The first and second levels of the boat incorporate 14 cabins – all of which have their own private balconies and have been tastefully furnished with either a double or two single beds. Of the 14 suites, 4 are master suites, some with their own private outdoor areas. These master suites are all larger than the 10 standard suites. Because of the limitations regarding power, none of the suites has been fitted with air conditioning units. However, each private space has been designed with the African summer in mind, and clever use of shutters situated on the outer edge of the deck and fans ensures a cool experience even during times of the year when external temperatures soar. Uniquely, the entire boat including the top deck, living and dining area, has mosquito screening. The top deck is air-conditioned and consists of the dining room, the lounge, a bar and a sunbathing area complete with private pool. The interior furnishings have been designed by one of South Africa’s top designers and this can be seen by the elegant, timeless look that has been created. Also to be found in the living area is a library of books, numerous games and a telescope for studying the stars at night. When looking at the design it is apparent that no expense has been spared in creating a houseboat of a world-class standard, and this is especially so when one considers this boat was built on the banks of the Chobe River. 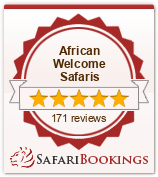 Land-based half day 4×4 game viewing in Botswana’s Chobe National Park. A helicopter situated a 10 min drive from the base camp allows guests aerial game viewing, or to use it as a transfer shuttle to Victoria Falls or the OkOkavangoelta. The above is at an additional cost. The Chobe River area has two seasons. The summer or rainy season begins in October and ends in March. In October the weeks preceding the coming of the rains tend to be the hottest with temperatures reaching 40ºC. During the rainy period, which lasts until the end of February or early March, the days are hot and generally sunny in the morning with afternoon thunderstorms – usually in short, torrential downpours during the late afternoon. Day time temperatures can rise to 38ºC and night time temperatures drop to around 20ºC – 25ºC. The days are dry, sunny and clear while evening temperatures drop. Day time temperatures generally reach 20ºC and evening temperatures can be as low as 5ºc. virtually no rainfall occurs during the Winter months.